In Inspired creative writing Alexander Gordon Smith reveals some brilliant insights into making your writing more effective. Drawing on his years of experience as a writer, editor and publisher, he shares insider tips on every aspect of writing, from overcoming writer's block, to creating characters so real they leap off the page, via how to choose your writing style, how to develop and maintain the right atmosphere for your writing, and much more besides. 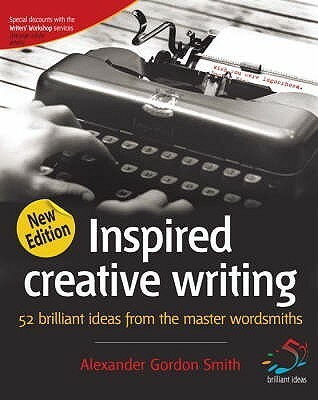 Packed with practical and realistic advice, ideas and techniques, this book will prove an invaluable aid to any writing experience. Whether you write part-time as a hobby or are intent on being the next Grisham or Proust, combining Inspired creative writing with your passion and talent will prove a winning formula. This has definitely been the week to finish books! =) I've been working my way through Inspired Creative Writing for the last few months, taking it idea by idea. Alexander Gordon Smith shares ideas on how to focus and expand your creative written work. I loved the breakdown of each idea aligned with an explanation and a quote from where the idea seemed to have stemmed. I think all creative writers will gain knowledge, ideas, and varying perspective from this book. It definitely helped me birth new ideas that I've been toying with over the last few weeks. The only thing that disappointed me was the lack of examples. When reading about writing, I like to have writing examples. A short little blurb, paragraph, page that depicts the explanation. Giving readers/writers that "Ohhhhhhh" moment of understanding and application. However, Smith did add in Q&A at the end of each idea, which allowed for a further analysis of how idea-application would turn out. Though, honestly, I skipped most of those.